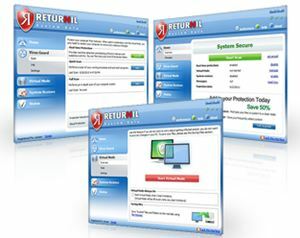 Returnil System Safe Pro is a Windows application which has been designed with a combination of antivirus, anti-malware, system restore and a virtual system to protect the computer from all types of viruses and other malicious threats. In order to prevent the actual operating system from been affected by viruses, Trojans, malware and malicious threats, the program will clone the operating system and create a virtual environment for running unknown application and web browsing in an entirely isolated environment. Anti-malware and anti-spyware – real-time and on demand protection against viruses and spyware for all PC users. Virtual mode – keeps safer with an extra layer of protection while browsing the web or running unknown applications. System restore and rollback – allow users to recover infected files or restore their system to a clean state. Cloud-based protection – utilize the community to find and clean virus infections sooner. File manager – allows for saving approved changes to real environment. 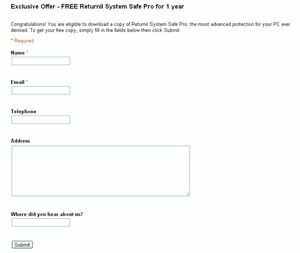 Visit Returnil System Safe Pro promotion page, enter name (required), email address (required), telephone, address, where did you hear about us? and click “Submit” button. Then you will redirected to a page which contains a download link and license key number. Download the program and enter the license key number during the installation wizard.